i need to finish around the screen, add a sub and surrounds. also waiting for an amp and pre/pro. and some finishing touches to the room. 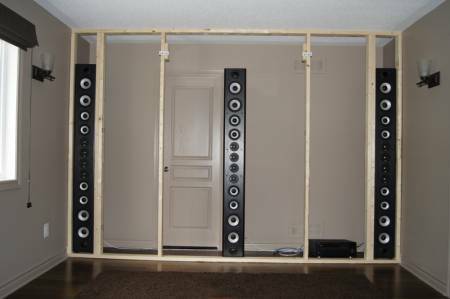 WOW, talk about a "wall of sound"! I was wondering how QS8s mounted to the ceiling would do in this particular setup, with the wall side of the speakers against the ceiling, spaced about midway between side walls and projector, so that sound would reflect off of the wall down into listener's ears. QS8's all the way you are sitting pretty tight to the side so the more dispersion the better, IMO. 2 would be enough unless you are looking to add another row of seats. btw i sit in either of the 2 centre seats, is this considered tight, i agree with you that it would be tight to the back wall. How do you plan on getting in/out of that room after you finish the wall behind the screen?